siphon off some water for tests 水を吸い上げていろいろな検査をする. siphon petrol (out) from a tank into a can 石油をタンクから缶へサイホンで移す. Heavy taxes siphon off the profits. 重税が利益を吸収する. From Middle French siphon, from Old French sifon, from Latin sipho, from Ancient Greek σίφων (síphōn, “pipe, tube”), of uncertain origin; possibly related to Latin tibia (“pipe, flute of bone”), reflecting a hypothetical late Proto-Indo-European *twi-, *twibh (“hollow”) root, and the irregular forms suggest a non-Indo-European loan source. 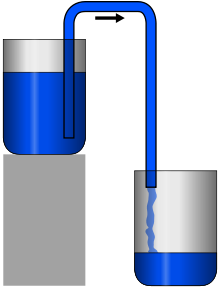 A bent pipe or tube with one end lower than the other, in which hydrostatic pressure exerted due to the force of gravity moves liquid from one reservoir to another. (biology) A tubelike organ found in animals or elongated cell found in plants. (transitive) To transfer (liquid) by means of a siphon. He used a rubber tube to siphon petrol from the car's fuel tank. (transitive, figuratively) To steal or skim off in small amounts; to embezzle.